Flashback Friday – Wanna play along? I’ve come to an important decision. My blogging needs direction. I’ve been flitting around participating in various weekly blog events like Head or Tails, Music Mondays, Wordless Wednesdays, and Singular Saturdays which I have found highly enjoyable. I’ve also considered joining in on Soap Opera Sunday, but to be honest I’m just not that into drama. However, I have lived a lot of different places and have done quite a few interesting things in the course of my life and I KNOW my bloggy friends have too. With that in mind I decided to try an experiment. I’m launching what I call Flashback Friday. The idea is to post about anything in your past. Put up pictures of yourself in embarrassingly dated clothing. Dolphin shorts and feathered hair anyone? Tell the story of something that has happened. The arena is wide open. Chose any medium you wish, but focus on some element of your past that you wish to share. Jenn in Holland was even cool enough to make me a couple of buttons. Seriously, how cool is she??!! Choose your flashback, grab a button and join in the fun. Leave a comment and read other people’s flashbacks. 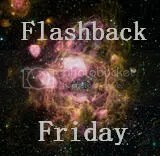 I plan to put up my first Flashback Friday post on Friday, February 1st. It seems like as good a day as any and allows two weeks for preparation. ~ by CableGirl on Friday, January 18, 2008. You know what’s funny? I was thinking about this exact idea a few days ago. I may just join in the fun. Hey, those buttons look so cool on your black background. I like ’em a lot! You know I am in for the fun. I think it will be fun to tell more tales of the old days…. I’ll seriously consider it. It sounds like it could be fun. Hey, CG, that’s the day for the unveiling of the Writing Game pieces… LOL. Should I change the dates for those? I was asked not to use Mon, Wed, Sat, or Sun… so I chose Friday, Feb. 1st. I love this idea, but now am not sure what to do with all those stories! And the buttons are awesome. That sounds like fun! Can we participate if we don’t have pictures, but have flashback stories? All my pictures are in IL and I live in MA. Sounds like fun! I’ll have to get my act together to join in. And my favorite button is the one with the Dali watch. Too bad my scanner is acting up. I have some fun photos with this teenager in a Molly Ringwald bob haircut with spikey bangs. Oh, wait! That’s me. And my hair is still in a bob. This is an excellent idea – not to mention gives me some direction in my blog at least once during the week! Yep, I am so there. This is kismet. I started doing Flashback Fridays a few months ago and Jen thought i got the idea from your blog. Actually there are couple of blogs that do “throwback thursdays” focusing more on music. I thought a Flashback Friday would be a great way to kick off the weekend. Once I move to Italy I might do What’s Cooking Wednesdays. I thinks it’s a great idea, although some of my flashbacks may be more like Soap Opera Sunday! I’d like to play again. Do you have a code I can use for the button?